Director Sanjay Rawal’s eye-opening feature documentary, Food Chains, shines a light on the abuses suffered by farm workers who work long hours to gather much of the fresh produce that ends up on the tables of millions of Americans. The film (on limited release in the US this autumn) follows members of a worker-based human rights organisation, the Coalition of Immokalee Workers (CIW), documenting a six-day hunger strike they held outside the Florida headquarters of one of the United States’ largest supermarket chains. Touching on the history the US’s heavy reliance on migrant workers to harvest fresh produce and exposing how the industry’s economics has fostered a work environment that features abuse and injustices (including modern-day slavery), Food Chains focuses on the supermarket’s reluctance to even open discussions with the CIW and becoming a participant in the Campaign For Fair Food. Rawal’s film highlights that participation in the scheme would be hugely beneficial for these workers, meaning an increase in the wages and ending their exploitation. Composer Gil Talmi is a keen supported of “socially conscious films” and his resumé includes excellent scores to a number of documentaries including Between The Folds (2008), Tales of The Waria (2011) and Forgotten Ellis Island (2008) and, on paper, is an ideal choice for a project such as Food Chains. Talmi is the ideal choice, delivering a score that works both in the film and as a separate musical experience. In keeping with the filmmaker’s goal of focusing on the hope and promise that things could change through the work of the CIW, Talmi’s score emphasises this optimism by using a blend of subtle Latin colours and electronic textures. Acoustic guitar, mandolin, banjo and dobro lead the way in producing an upbeat accompaniment to the workers’ passion to succeed in their long-term struggle to overcome the reluctance of some national companies to participate in schemes that would benefit those who are key to these huge businesses’ success. Tracks such as the opening “Exploitation”, “Day By Day”, “Repercussions” and “Emerging Rights” all share a forward dramatic momentum using up-tempo guitars, brushed drums and subtle electronic beats and piano to give the unfolding story a strong forward drive. The focus of the score (and the film) on the workers’ passion to succeed rather than to dwell excessively on the terrible experiences is particularly highlighted in “Repercussions”. Here the film discusses the issue of the sexual harassment of women in the workplace but, rather than risking coming across as being patronising by echoing this terrible subject in the music, Talmi focusses instead on mirroring the strong resolve of the workers to stop these injustices. Both film and score balance the need to highlight the terrible conditions the workers face with the strong sense of quiet but determined optimism from the labourers to succeed. In an endeavour to deliver a balanced view, the score does feature sombre passages where the upbeat music would seem inappropriate. The film’s exposure of the plight of farm workers in the vineyards of the Napa Valley in California who are bussed in from outside the area (living in homeless shelters) because they are not paid enough to live close to where they work – and where local churches see more people go to church to find somewhere to live rather than seeking “Spiritual Solace” – and the telling of a terrible case of the modern-day slavery of farm workers in Immokalee in 2008 (“It Happened Right Here”) are just two examples where Talmi exchanges the overriding optimism of the score for more reflective underscoring featuring halting dobro and dark electronic textures. The film’s conclusion coincides with the ending of the CIW’s six-day hunger strike and, although unsuccessful in their attempt to alter the supermarket’s reluctance to meet with the campaigners, Rawal’s documentary ends on a positive note with the feeling amongst the activists that it is only a matter of time before they will bring about the change they want. A beautiful piano passage heard in “We Will Still Be Here” reminds us that those trying to bring about this change are suffering day-to-day still but that it is their own self-imposed suffering (those workers on hunger strike are not earning a wage) that will improve the human rights for all. The remainder of the score then returns to music celebrating the workers’ passion and optimism. This effect is particularly vibrant in the latter half of “We Will Still Be Here” where the addition of hand clapping and wordless vocals reinforces the human aspects of this story. Talmi’s score is a worthy accompaniment to a documentary that is quite shocking in terms of describing the human abuses that are experienced by thousands of workers not protected by much of the labour laws available to many of those working in the United States today. Earning about $40 a day for gathering upwards of 4,000 lbs of produce (equating to about 1 cent a bucket collected) and the reluctance of large supermarkets to pay farm labourers one cent per bucket extra (doubling their workers’ wages, costing a negligible amount to businesses’ multi-billion dollar income and adding about forty cents per year to the average Americans’ grocery bill) is a situation I had not known about before becoming aware of Sanjay Rawal’s film via Gil Talmi’s score. The decision of Talmi to highlight the plight of the Mexican immigrant workers through the use of Latin colouring of the score, but at the same time not having the music be too heavily ethnic in nature, spotlights the specific story featured in Food Chains and reminds us (perhaps only subconsciously) that the plight of those of the CIW is both a countrywide and worldwide issue. 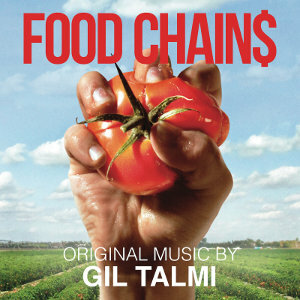 Food Chains is a very enjoyable score, full of upbeat music that’s a satisfying listen away from the film and is available from the usual online stores from the end of October 2014. Audio clips can be found HERE. The review peaked my interest in having a listen to the clips. Very nice! Echoes of a cross between Ry Cooder, W.G. Snuffy Walden and Rolfe Kent. Even if it’s unlikely I’ll see the film, the soundtrack is well worth a purchase, I’d say.